Photolalia: Oxford Circus -- Some images... and a few brief words about them. (London, 1985. Copyright Hamish Reid). One of my all-time favourites. 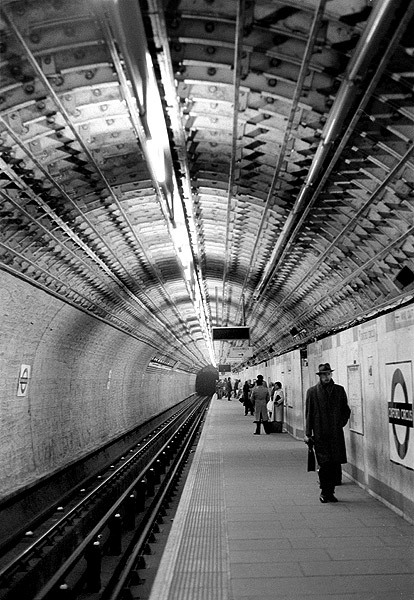 I had this thing about the Underground in London -- apart from the obvious, like so much else about London in those days, this was a place of almost Dickensian filth and noise, a sort of mirror image to the decay above ground during the Early Thatcher years. Anyway, I used to make my way through Oxford Circus tube several times a week -- shopping, work, whatever -- and in those days the whole station was being remodelled after a fire. And one day there it was -- this vision of lines and circles, almost entirely black and white in real life. I rushed home on the Northern Line to get my camera, and returned later the same evening. And this is one of the two or three shots that resulted. What really makes this work, though, is the man on the right. I didn't even notice him during the shot -- far too rushed for that sort of thing -- but the shot's one of those subtle decisive moment things. Had the man not been there, the symmetry of the shot -- and the lack of foreground anchoring -- would probably have turned this into something much less compelling. Your work has an industrial, man-made beauty that makes me happy to be alive. I love your photography because it speaks to something both aesthetic and deeply important in me. woww... i'm speechless. this is great!